Is that an oversized chocolate bunny drifting into the right of the frame? Or is it just the Stay Puft Marshmallow Man all dressed up for Halloween? Of course it could be just a cloud. But what’s the fun in taking things so literal? It’s funny what we see, and what we don’t see. 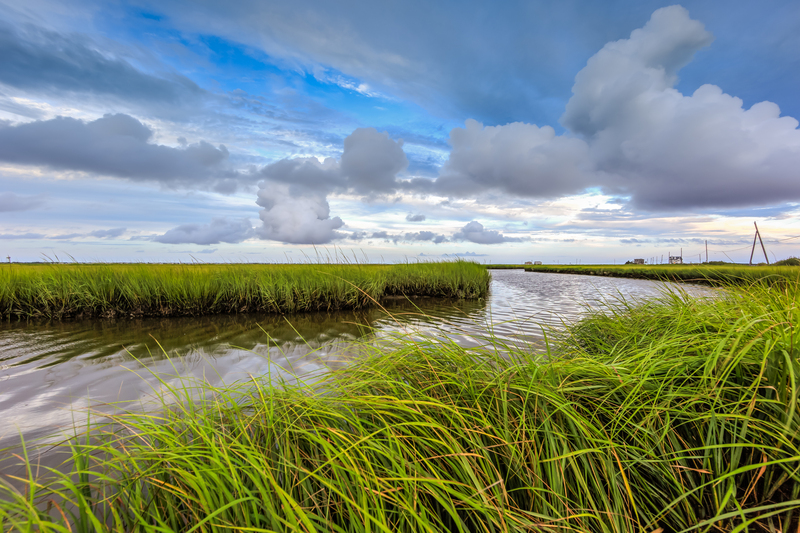 As I was making this shot I was going through my usual mental checks: capture cool cumulus clouds; get the bend in the estuary to create movement; and finally, to get the wind blown marsh grass in the foreground. Pretty technical, pretty straightforward. Rote process aside it wasn’t until I was reviewing my shots in post processing that I took note of what is clearly a bunny shaped cloud momma cutting across the sky to herd her little bunny-cloud clan. I may not have the greatest imagination, but this what my mind has gone and done. I’d like to give a special shout-out to the lunar cycle for allowing this to time up with a fortuitous low tide. The reduced water table gave me access to a low spot on the marsh that is otherwise submerged. That said walking around marsh muck in flip-flops isn’t exactly a good time, but remember, whatever it takes to get the shot!